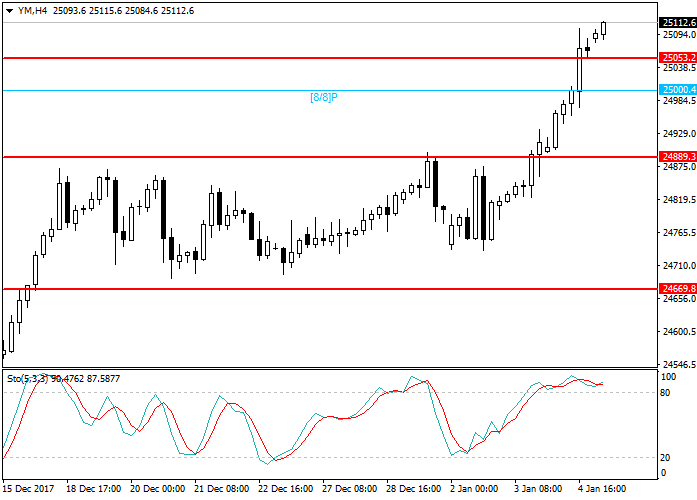 In 2018 Dow Jones is renewing its highs: this week the price has reached the level of 25104.6. The growth is mainly due to positive US statistics: ADP Employment Change indicator grew by 250K, significantly exceeding the expectations of 190K. Today the additional employment market data will be published. The experts consider the US economy is growing: the Initial Jobless Claims indicator confirms it. During last 148 weeks, the index has been staying below the level of 300K, which is the longest period since 1970. US companies can be supported by the tax reformation, signed by Trump. It will allow the corporations to return part of foreign assets at low rates. Preliminary estimated, due to exceeding liquidity many companies, such as Coca-Cola, Amgen, and General Electric, will begin to buyback the stocks, which cause additional demand and the growth of the market value. Stochastic is at the level of 85 points and reflects the possibility of correction. Short positions can be opened after the breakout of the level 25053.2 with the target at 25000.4 and stop loss at 25134.1.